With the release of The Elite Book 2 in the series coming out this Tuesday, i felt that i owed it to myself to reread the first installment into the story so that i’m fully up to speed. It’s The Bachelor meets all things Dystopia and i think that it’s exactly what i needed. America: She’s the female lead in this story and we get everything from her POV. She lives in a province known as the Carolinas in what is now knows as ‘Illea’ which is the result of what the USA has become after 4 world wars and being taken over by a chinese invasion. As we expect in stories that are of a dystopian nature, there is a class or caste system and in this situation, America’s family is a Five which is on the lower end of the scale. (ones are royalty, 2 are wealthy, on and on until you get to 8 which are homeless. 5’s barely get by and while they don’t suffer as much as 6s who often don’t have enough to eat, they certainly aren’t comfortable in life). Aspen: He is the initial love interest for America in this story. He’s a little bit older than she is which is great, however his family is in a lower caste – they are 6’s and that means that it would be a bad idea for America and Aspen to be involved. They have been ‘in love’ though for about 2 years now at the onset of the story and find themselves in a happy yet secret place. Maxon (Prince Maxon): he is the focus for all things that change from a few chapters in. As society is trying to rebuild, it’s determined that if there is a daughter born to royalty, they are married off to another country to forge bonds. If there is a son however, they go through ‘The Selection’ where 35 women are selected (1 from each province) and it is the Prince’s job to select one to be his wife. It’s in fact the same way that his father the King found his wife. (and they are quite happy together). So….the story opens up basically with notices going out to all homes that have daughters that are deemed ‘of age’ to participate in The Selection, and while America has no intention of participating since she’s in love with Aspen, she’s convinced both by her mother (through a bribe of sorts) and by Aspen (through guilt) to participate. She puts in her application and low and things go from there. Just when things couldn’t get any worse, because America figured that she had no chance since she’s just a 5, she’s chosen from her province, Aspen decides that things shouldn’t continue between them (because of his male pride/ego) and off she goes. We find out quite quickly that America is a fan favorite and is great competition. while she’s still heart broken over what Aspen has done to her, she’s not ready to jump head first into the chance that she could fall in love with Prince Maxon. As a result, she’s decided that maybe she could become a friend to Maxon and in turn, stay on through the competition long enough to benefit her family (they get financial support for the length of time that their child is in contention), and Maxon agrees. Mind you, his motives aren’t so platonic. From the moment that he meets America, she yells at him, thinks ill of him, yet he’s drawn to her. He likes that she doesn’t treat him as everyone else does, and there’s a spark that he feels. So the quest throughout this book is Maxon trying to figure out if there’s anything between him and America, if there’s another girl that ‘does it for him’, and to make people take him seriously as a leader of Illea. When things seem like they still can’t get worse, there have been multiple rebel attacks on the palace, a new rotation of guards….and Aspen shows up among those guards. Enter LOVE TRIANGLE. couldn’t expect anything else from a YA book right? so, that puts a crimp in things because we just don’t know where America’s head is, if it’s going to make a difference, and what will happen to Maxon since we’re assuming that his decisions will be important for the safety not only of those in the palace but for the country. 2) Will Aspen make things uncomfortable for America while she’s deciding what she wants? 3) will the rebels break through and will something horrible happen to the girls, the royals or Maxon/America? 4) who will Maxon choose? there are so many more questions, so i’ll have to wait until Tuesday to know how things turn out. 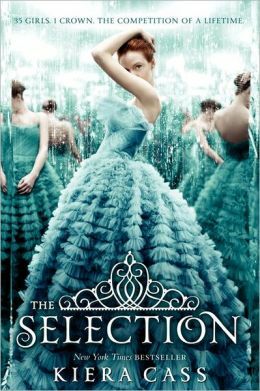 This entry was posted in Dystopian, Reviews, Young Adult and tagged Kiera Cass, The Elite, The Selection by iscm13. Bookmark the permalink.